Chief financial strategist providing professional advice to City Manager's office, City Council and Mayor's office and executive management. Responsible for all financial functions within the City of Monterey including a $100 million budget and a $60 million portfolio. Chief Financial Officer and City Treasurer with oversight over all accounting and financial reporting, budget development, treasury functions, debt management, purchasing, and revenue collection. Also served as City's Financial Services Manager from 1995 to 1999. Oversee Finance Department Accounting Division including all financial reporting; oversee payroll, accounts payable, accounts receivable, utility billing and collection, business licensing; responsible for financial management software system; oversee redevelopment agency accounting and reporting. Prepare all city financial reports; coordinate all outside audit activity; oversee maintenance of general ledger; responsible for fixed asset and cost accounting. Prepare audit programs; perform audits of governmental agencies and private companies; prepare financial statements; conduct internal control reviews; interact with clients; prepare tax returns. Perform audits of governmental agencies and private companies; internal control review and evaluation; compliance and substantive testing; financial statement preparation; tax return preparation. Don Rhoads has been the City of Monterey's Finance Director and City Treasurer since 1999, producing balanced budgets every year, good times and bad, for the $100 million organization. 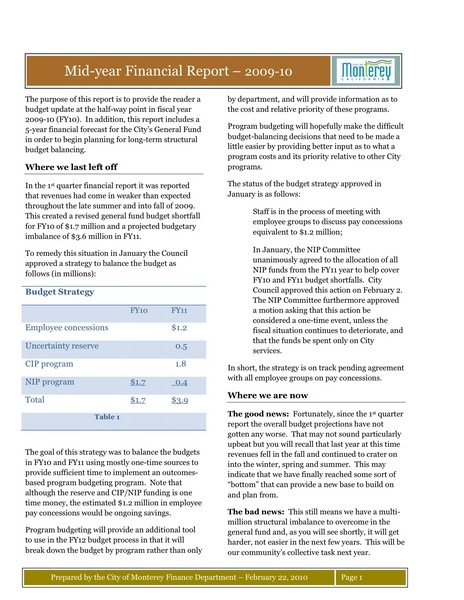 In 2011 he successfully managed $5 million budget reduction plan along with an extensive year-long Priority-Based Budgeting process designed to gather vital input from the community as to how to allocate scarce budget resources. Current professional goal: Rebalance City budget in light of the elimination of City's redevelopment agency. Current academic goal: Obtain Master of Liberal Arts degree from Harvard University Extension School. Adjunct Lecturer (part time) for undergraduate business school course in governmental fund accounting.